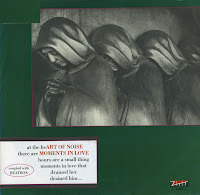 'Moments in love' was a beautiful electronic track by Art of Noise, released in the spring of 1987. Although it wasn't their biggest hit in the UK, where it peaked at number 51, it did reach number 10 in the Dutch Top 40, making it their biggest hit up to that point - surpassed only when they released 'Kiss' with Tom Jones a few years later. There are several versions of 'Moments in love', but this single version is by far the most concise. 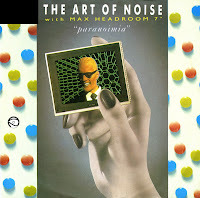 Art of Noise had a hit with 'Paranoimia' in 1986, a track featuring the vocals of the computer generated television personality Max Headroom. When the band released a greatest hits compilation in 1988, the album was promoted with several singles. One of them was 'Paranoimia '89', a remixed version omitting Max Headroom's vocals and based wholly on the music by Art of Noise. The remix was made by Dutch remixer and DJ Ben Liebrand. The single did not chart in any territory. 'Kiss' is a cover version of Prince's 1986 hit single. 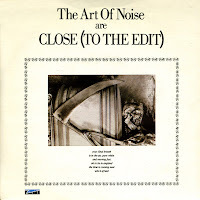 It was recorded by Art of Noise and Tom Jones as a new track for Art of Noise's 1988 compilation album 'The best of the Art of Noise'. 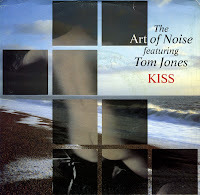 The track features elements from previous Art of Noise singles 'Close (to the edit)', 'Moments in love', 'Paranoimia', 'Dragnet' and 'Peter Gunn'. In the UK, the Art of Noise and Tom Jones improved on Prince's success by peaking at number 5 in the singles chart, one position higher than the original. In the Netherlands, the single also reached number 5, but there Prince had reached number 2 just two years before. 'Close (to the edit)' is one of the weirdest tracks I heard back in 1984. It took me some time to get used to this seemingly random array of noises. It takes its title from 'Close to the edge' by Yes, and also samples 'Owner of a lonely heart' by the same group. The single heavily features the recorded sample of a car, a VW Golf, belonging to band member J. J. Jeczalik's neighbour, stalling and restarting. 'Close (to the edit)' did not chart initially. It still reached number 8 in the UK singles chart when it was re-released in November 1984. 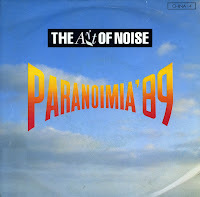 'Paranoimia' was released as a single by the group Art of Noise in 1986. The track featured the computer generated television personality Max Headroom on vocals. The original version of the track (without Max Headroom) features on the album 'In visible silence'. The single reached number 12 in the UK Singles Chart, and peaked at number 11 in the Dutch Top 40.